Ms. Hughes was born on August 8th,1938 in the Blue Creek Community of Grayson County, to parents O.V. Luper and Rosie Mask. She worked for over 26 years with Burlington Industries and 20 years with Sherman ISD. 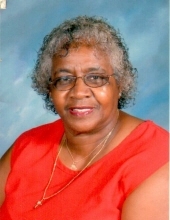 Ms. Hughes passed away at Wilson N. Jones Reginal Medical Center on Wednesday January 23rd. She is survived by her children: Brenda Chatman, Linda Akers (George), Martha Chaffin (Gary), Donna Phea (Elton), Gerald Hughes (Karen), Marilyn Crawford (Michael), Derrick Hughes (Micha’el) and Tiera Hughes, Sister Tommie Cross (David), brother James Luper (Sylvia) 14 grandchildren, 36 great grandchildren and many other family members and friends. To send flowers or a remembrance gift to the family of Elnora Luper Hughes, please visit our Tribute Store. "Email Address" would like to share the life celebration of Elnora Luper Hughes. Click on the "link" to go to share a favorite memory or leave a condolence message for the family.